Fodder Definition | What do Horses Eat? Introducing Fodder – what it is, how it can be used, and where to purchase it. But first, the fodder definition: food for livestock. The second question we will be addressing: What Do Horses Eat? Fodder Definition | Fodder & What Do Horses Eat? Between drought and less than desirable economics, many have been looking for alternative feed sources. Hay prices are rising and pastures are not getting enough rainfall. Could there be another way to feed that’s not so heavy on the wallet? Would that mean a sacrifice in quality and nutrition? Until recently that was a trade-off that many were forced to take, but there’s a new kid on the block called “fodder”. Never heard of it? You’re not alone! Fodder is a sprouted cereal grain such as barley or wheat. The sprouts are grown right on your farm or ranch, and the growing cycles are as short as 6 days. They do need a precisely controlled environment to grow, but turn-key systems are available that do all the work. Now I should be a bit clearer when I say “harvesting”. You don’t need a tractor, a shovel, a green thumb, or even dirt for that matter. The fodder grows on trays with no soil, no fertilizer, no pesticides, and it takes less than 3% of the amount of water required for standard forage production. Better yet, it’s on a rotational basis so you get feed every day, year round. The roots grow together forming a mat that hold everything together. 1 pound of seed will turn into 7 pounds of sprouts that are ready to feed. Horses eat the entire mat including the roots. It may take a few days to acclimate to the new feed depending on the horse, but after that – look out! Now, you’re probably still wondering, what do horses eat? Fodder, the answer is fodder. Horses eat fodder. Horses particularly enjoy this fodder that I will describe below… This fodder is better than hay for horses because it’s healthier, cheaper to get a hold of, and easier to grow. So what’s the catch? Surely you’re thinking this lush green grass is going to cause colic, laminitis or be cost prohibitive. We ask this because in the past grass has been avoided due to the colic. However, the key thing here is that it’s not a grass – yet. A sprout at 6 days is dramatically different from both dry grains and green grass. Grains are acidic in nature and although they have potential nutrients, they’re not in a form that can be easily digested. As grains sprout hydrolytic enzymes breakdown compounds into simpler, more digestible forms. What you end up with is an increase in available vitamins and minerals, and a neutralization of anti-nutritional compounds. It’s a high protein, high energy, digestible (over 70%), wet feed. Horses maintain better hydration during training, events, or racing. The digestibility means there’s not an excess of non-structural carbohydrates (i.e., NSC, sugars) to move on and ferment in the cecum. This fermenting would eventually increase acidity, kill good bacteria, and cause body-wide inflammation (particularly in the lamina of the feet = laminitis). The downsides of green grasses don’t exist in sprouted grains. How will fodder benefit my horse’s health? Wes Leckner and Tracy Underwood, co-owners of the Santa Rosa Equestrian Facility, board between 90 and 100 horses at their training facility in northern California. Tracy reports, “The health benefits of the fodder are amazing! We had Clair Thunes, a PhD in nutrition from UC Davis, do an in-depth analysis of our fodder. Basically, the fodder provides an energy dense, live feed source that has a consistent nutritional content in addition to greater amounts of lysine, vitamin E and omega -3 fatty acids than hay. Many benefits that we have observed but don’t necessarily appear in the written analysis include shinier coats and an improvement in attitude and energy, especially in the older ponies at our European Pony School. Our barn vet, John Kaufman, DVM, attributes this to the seniors (some lacking teeth) being able to eat, digest and therefore, get the nutritional benefit of the food…” In late June of 2015, a small sprouting system will be delivered to Colorado State University. They will be performing research on the effects during pre and post op equine surgeries. With the known health benefits, it will be interesting to see the recovery time. The university learned about sprouts through a local dude ranch using fodder. They could see improved health in the horses and asked what they were doing different. 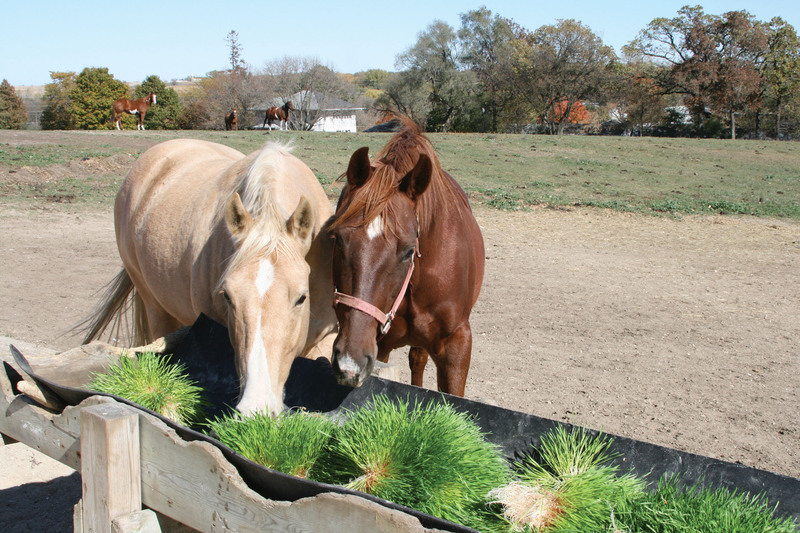 You can’t feed 100% fodder as horses still need some high fiber dry roughage in their diet. You can however replace about half of your hay, as well as reduce or eliminate grains. We’ve found that grain hays, grass hays, and similar feeds work best. They actually slow digestion and improve intake of the nutrients in the sprouts. Alfalfa and fodder sprouts however will digest too quickly combined, and do not work as well. It is possible to have too much of a good thing. Cherokee Park Ranch in Livermore Colorado put together a video about their fodder system and their daily routine here. So now the question – is it affordable? It varies for everyone, but it’s extremely cost effective for most. Turn-key systems have an up-front cost to consider, but the payback is typically 1.5 to 3 years. Wes and Tracy brought in two systems built by Simply Country, Inc in an effort cut feed costs. Hay expenses are reported to have dropped $200 – per day. They have made a huge leap forward in their feeding independence. If you’d like more information on how you can use sprouts, please contact Simply Country and ask about their Fodder Works sprouting systems. Thanks for giving us a read! Are you passionate about homesteading? We’d love to stay in touch. Be sure to subscribe to our emails so you get the most recent homestead updates. Also, like our facebook!